Iowa history is not just limited to events from 50, 100, or 200 years ago…it is also yesterday, last week, last year, and a decade ago. The preservation of Iowa history takes teamwork, and we encourage everyone to help us save the state’s newspaper legacy and ensure that the “first draft of history” is available and accessible for generations to come. 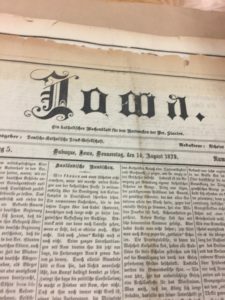 Since the 19th century, the State Historical Society of Iowa has led the way, preserving and providing public access to almost 40 million newspaper pages from across the state. Over the last decade, communities and organizations in every corner of Iowa have taken an active and vital role in these efforts. In 2017, the State Historical Society of Iowa and Advantage Preservation teamed up with libraries and other community organizations to preserve 260,700 newspaper pages. That brings the total of preserved weekly news pages since 2003 to more than 1,578,500 – all thanks to statewide cooperation. But there is more work to do. Currently, 242 Iowa weekly newspapers annually publish approximately 214,500 pages. And as of 2018, a backlog of 1.6 million weekly newspaper pages published since 2003 awaits preservation. Additionally, there are even older archives of approximately 3.5 million daily and weekly newspaper pages published from the 1840s through the 1960s, all awaiting preservation from paper to microfilm. We believe the preservation of our collective history is a shared responsibility, and we encourage you to “get involved” by joining us in our mission to ensure that Iowa’s “First draft of history” is available and accessible for generations to come. Each line below represents a date range of newspapers to be preserved to a reel of microfilm. If you are interested in helping to ensure that your community’s recent history is preserved for future generations contact us today! Please consider sponsoring a reel for $250, and join us in our mission to ensure the preservation and accessibility of the history contained within the pages of your community’s newspaper! Each date range listed above represents an Iowa newspaper that needs to be preserved on microfilm. Please consider sponsoring a reel for $250, and join us in our mission to ensure the preservation and accessibility to the history of your community contained within these newspapers!